Two days after the shocked world learned of the assassination of U.S. President John F. Kennedy, this stark image shows the shooting death, which was carried live on American television, of Lee Harvey Oswald, the man arrested by Dallas police and charged in the President’s murder. 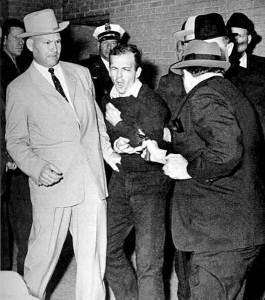 This image was photographed in the Dallas police station as Oswald was being transferred to a jail. The man who leapt forward and is seen here at the moment he fires his gun at Oswald, was a smalltime Dallas gangster named Jack Ruby. The Dallas Times-Herald, 1963. Photographer: Robert H. Jackson (winner of 1964 Pulitzer Prize). Accessed 8 July 2010. The Pulitzer Prizes | Breaking News Photography: Archived Images. Accessed 8 July 2010.